El Mirage Property Management, El Mirage Property Managers, El Mirage, AZ Property Management Companies. Situated within Maricopa County, El Mirage includes just 9.7 square miles of land. Within the town, residents can find a number of recreational programs and educational classes offered by the city. After residents find their dream home with El Mirage property management, they can enjoy community classes and events at locations like the Dysart Community Center. While there are a number of pocket parks in the community, some of the best green spaces are Bill Gentry Park, Buena Vida Park, Basin Park and Gateway Park. At Gateway Park, residents will find numerous athletic courts and a splash pad for escaping the summertime heat. To discover a kids' play area, baseball fields and picnicking areas, residents should check out the Bill Gentry Park. Meanwhile, residents can congregate and enjoy a healthier lifestyle at the El Mirage Community Garden on North El Mirage Road. For shopping options, residents can visit Walmart, Plaza El Mirage, Walgreens and local boutiques. 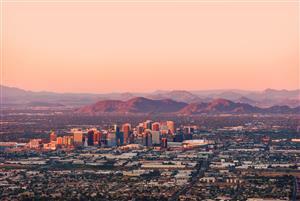 Top restaurants can be found in downtown El Mirage and along the Phoenix-Wickeburgh Highway. Some of the area's best Mexican cuisine can be found at Lupita's Mexican Restaurant, Rio Mirage Cafe and Humberto's Taco Shop. For an Irish bar experience, check out the Irish Wolfhound Pub. Sunrise Donuts is a local favorite for breakfast, pastries, coffee and donuts. Meanwhile, excellent Vietnamese, Asian and vegetarian cuisine can be enjoyed at Saigon Kitchen.